This week the DECR has a marine biologist from REEF on Grand Turk to provide education and training on the lion fish invasion we are experiencing. The lion fish is an Indo-Pacific fish that was basically dumped out of a tropical fish tank in Florida sometime around 1998. It has since reproduced and invaded the reef systems from New England to Barbados. 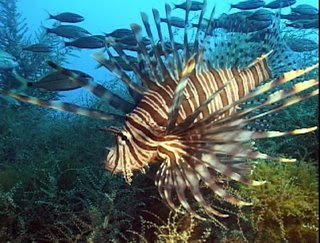 The lion fish has no natural predators in the Atlantic, reproduces at a very young age, and is an eating machine. Though small as reef fish go, it eats juveniles of almost every specie. It eats so much, that if not controlled it is possible that a lion fish population in the Turks and Caicos could eat all of the fish off the reef within eight years. The thing that makes the lion fish a spectacular predator is that it is covered with barbs full of a toxic venom. If you get stuck you can go into a temporary paralysis. OK, now to the heart of my story. We attended a lecture on the fish on Monday. Yesterday, we went on a dive to collect the lion fish off the reef. Dinah, who is here for six months running the after school homework program, likes to talk about how nervous she gets having to exert herself, and how she is the most comfortable just sitting and reading, and how she has lots of anxiety about things on Grand Turk... But yesterday she went on a dive to capture invasive predator fish with venomous needles all over there body where if you get stuck you can go into shock underwater. I'm just saying. We were partnered as one of several teams. I took the nets to snare the beasts. Dinah took the container to put them in. Several other teams were in the water, but we had a little weight problem and could not catch up with the other teams. Not long we came across our first lion fish hiding up under a coral head. It was very small. The trick to capturing them is being slow and working two nets around the lion fish until it swims into one. The key is to go very slow. Slightly startled, the lion fish swims very quickly back into and under the coral. In time, I was able to trap this first fish. We brought it down to the sand bottom. I put my puncture proof gloved hand over its head. Dinah opened the bag. I put the fish into the bag. Presto, just like Siegfried and Roy we had put our heads into the mouth of the lion fish and lived to tell the tell. I was thrilled, but wanted to come back to the boat with two, figuring that would make us look like we new what we were doing. We swam for several minutes without seeing another lionfish. Finally, back near where we had started we came across a bigger one. My heart started racing. I worked up far under a large coral with many holes. The lion fish was hanging under a ledge. I worked the nets around him but could only had room in one direction. I could not stay balanced and was finding it very difficult to not drift. I made a quick grab for the lion fish with the nets. Remember the key is to go slow. The fish swam up into the rock. We stayed and tried to make another attempt. But time and air were running out. Working dives are very different than recreational dives. But in our swimming around we came across a five foot green morray eel swimming in the open. This was the first eel I have seen here at it was spetacular. We had snuck up on it and were within two feet. Crazy cool! The two capture attempts had taken 55 minutes. I was pleased we had captured one and felt like others would see that we had tamed the lion fish. It would not be today. The other teams came back with four, five, and seven fish receptively. Our sad bag of fish looked very lonely in that crowd. But we will hunt again.